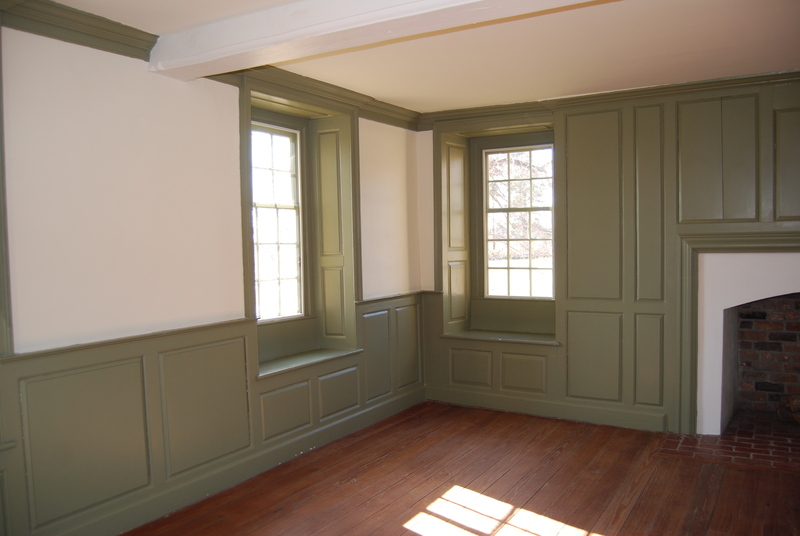 This room in Bacon’s Castle is known as the Ladies’ Chamber. My Aunt Martha was married in this room on Christmas Day, 1935. And Motor Man and I were married in this same room on February 2, 2002, (02-02-02). If you look closely on the facing of the window to the left, you’ll see evidence of my family’s years at the Castle. Remember I mentioned my Aunt Lucille in yesterday’s post? The initials in the top left corner in this next picture are those of her (future) husband, AGB, followed by hers: LME. They’ve been painted over many, many times, but are still visible. The initials in the lower part of the picture are my Uncle Andrew’s, ABE, and I’m guessing FEP was a girlfriend at some point in his young life. This is the back side of one of the doors located in the attic at Bacon’s Castle. Once again, we find Andrew’s initials. These carvings must have taken place after the ones in the previous picture, because MVB became his wife. What would the window facing and attic door tell us? That Andrew was the first boy in his family to get a pocket knife. That he once loved (or thought he loved FEP), but MVB won his heart. The window would tell us that Lucille, although she grew up to be prim and proper, was once a mischievous young lady. And that would be just a small fraction of what those windows and doors would tell us. If only they could. 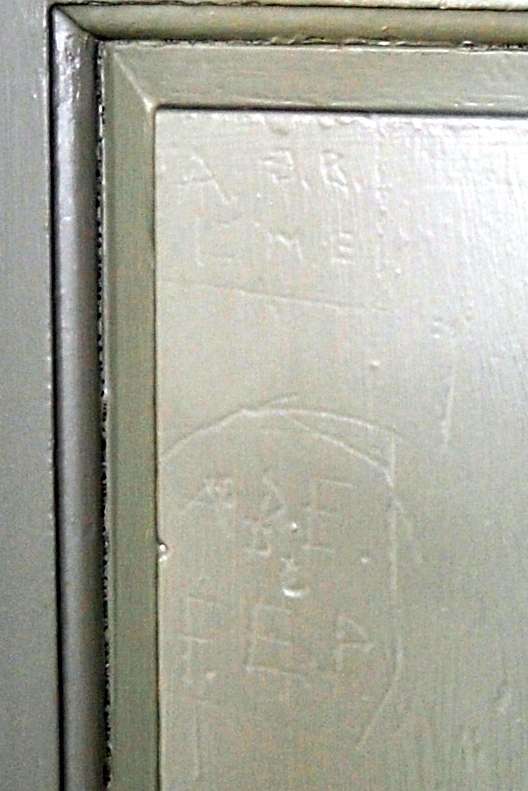 This entry was posted in Bacon's Castle, Family and tagged Bacon's Castle, carved initials, window etching. Bookmark the permalink. So much of our family history is there…hope the Castle stand for many more years. Sorry, that should be ‘standS’ ! LOL! What a cool room! Love the window seats. Good that they carved initials, history forever that they were there. Dianna I worked my way to here from older posts and you have confirmed my thoughts that Aunt Lucille could have been a bit fun in a mischievous way! Funny! Again, I am amazed! At the history in the house, and how well you know it. What a special blessing to have been able to be married there! That is too funny! It does make you wonder a bit about the back stories behind the changing initials, hmmmm? I am so glad you got to be married in a place that is beautiful….but mostly that it meant something to you because of your family history! What a lovely green room with beautiful light. The carved initials are meant to stay. So Rick and I need to carve out our initials at the farm some place? Hmmm…you have me thinking. This is so special! To think your ancestors left you such a legacy…not only in stories but their intials handcarved by them for generations left to come is something very meaningful. I love that generations were also married there. It’s a perfect room for a wedding. When we built our last house Jake and I wrote in permanent marker on the 2×4 studs before the dry wall was put up in his room. Things like our initials and dates. I think I even left a slip of paper in the living room wall with our names and such on it before it was sealed up…Just for fun. This posting of yours makes me wish I could take pictures of the inside of that house…or the outside. It is just so beautiful. Thanks for the peek inside the castle, as well as the lives of those who lived there. My daughter’s best friend has the same anniversary date, easy to remember. That is such a beautiful room. I like it’s name very much. Your wedding date is so fun and easy to remember too. I would mention these on any tour with visitors who were looking for family history above all else. Such a great reminder!! Very interesting that you know who the initials belong to. And what an interesting date for your wedding!! Easy to remember. My youngest granddaughter’s birthdate was 11-10-98, also easy to remember. I think it must be quite exciting to be part of this lovely castle. Your ancestors have left there mark there for ever and will always be a part of it. what a special room and a special story!! i want to carve my initials somewhere!! Boys and their knives! 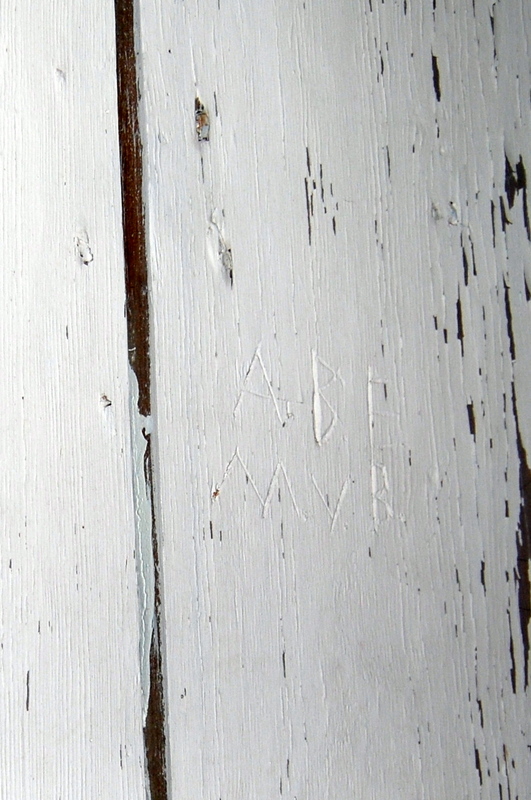 There are some initials carved in wood in one of the bedrooms here. I think it adds character to a home! This is a beautiful home to get married in. Thanks for sharing these photos and the stories. Bacon’s Castle is so lucky to have you as its ambassador. All of these personal details makes it mysterious and divine. I love that you got married there amidst the carvings and the rich history. I absolutely will visit it whenever I get that far east in VA again. You’re so right…..imagine the things the entire house has seen through all the many years it’s been standing (including your wedding to MM!). For your family to have been a part of the Castle’s long history is simply wonderful and the stories just add so much color and depth. A creative and interesting post, Dianna! Love the photos! What fun to imagine the stories the windows and doors could share. Reminds me of some of the carvings here in my own home. What a good blog. So interesting to hear about. Thanks!